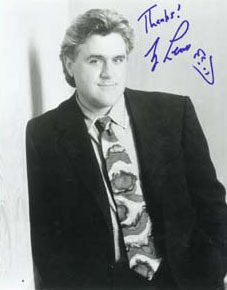 As a successful stand-up comedian, long before his Tonight Show days, Jay Leno performed as many as 300 nights a year. He was hired to write for the '70s sit-com Good Times, and briefly appeared in one episode. His fame really started with a few 1977 appearances on Johnny Carson's Tonight Show, and as part of the comedy ensemble in that summer's Marilyn McCoo and Billy Davis Jr. Show. The early Leno often told jokes with an edge, and was a frequent guest on NBC's Late Night with David Letterman show through the 1980s. He was also a perennial guest and guest host on Tonight, where his humor was well-received but began lacking the bite it had elsewhere. Presumably, he was trying to appeal to Carson's older, middle-of-the-road audience. It worked, and Leno was named Carson's "permanent guest host" in 1987, and when Carson announced his retirement in 1991, NBC named Leno as his replacement. Letterman was stunned, as Carson had been his mentor and The Tonight Show had been his long-time aspiration. Carson himself agreed that Letterman would've been a better choice, and advised him to walk away from the network. Letterman took an offer from CBS, and on Carson's last Tonight Show, Leno wasn't mentioned at all. After a few rough months as the new host, Leno eventually melted into the Tonight Show format. His monologues were longer than Carson's and not as memorable, but he projects an easygoing, nice guy persona that America seems to love. Leno's dilemma was that The Tonight Show needs to appeal to a young, hip demographic, but without raising eyebrows among the show's sizable older audience. It's a delicate balance that Leno mastered, and week after week, year after year, his Tonight Show remained #1 -- while Letterman's Late Show was consistently funnier. In 2004, Leno announced his retirement, effective in 2009, and NBC announced that Conan O'Brien would take over The Tonight Show. In 2009, the network promoted Leno to prime time for a Monday-Friday talk show, strategically thinking that the cost of producing a talk show is a fraction of the cost of an hour-long scripted drama, so Leno in prime time would be profitable even if his ratings were quite low by prime time standards. The ratings, though, were lower than the network's affiliates could tolerate, and within months Leno was reshuffled out of prime time and back to The Tonight Show. There he remained until a second retirement in 2014, leaving The Tonight Show to Jimmy Fallon. Hollywood Walk of Fame 6780 Hollywood Blvd.